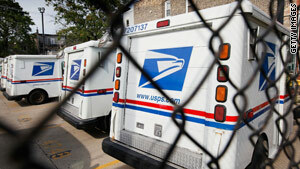 The December 3 report documents purchases that the Postal Service says are excessive given the economic climate. (CNN) -- The U.S. Postal Service spent more than $792,000 "without justification" on meals and events in one five-month period even as it reported losing $3.8 billion this year, the agency's inspector general says in a report. Employees spent $792,022 on meals and external events "without justification for food purchases, purchased alcohol without officer approval and exceeded the dollar limit for meals," the report says. Among the purchases were crab cakes, beef Wellington and scallops at an installation ceremony for one of several postmasters in the United States, the report says. Despite the Postal Service's mandate to curtail spending, its inspector general found that "imprudent spending continues to occur, including continued purchases of gift cards from unauthorized vendors and expensive items purchased as employee recognition awards and retirement gifts." Such purchases conflict with the agency's goal to drive down costs, according to the report, which covered spending during several months in late 2008 and early 2009. The Postal Service reported a $3.8 billion net loss for the 2009 fiscal year, despite cost-cutting and reductions in retiree health benefit payments. Asked about the expenses, a Postal Service spokesman pointed to an agency response included in the report. In that response, the agency's vice president and controller, Vincent Devito, agreed to enforce a spending limit on events and recognition awards as well as make sure employees justify business meal expenses. "We agree that further policy enforcement is essential to ensure that the policy is followed and imprudent spending is no longer an issue," Devito wrote. "It appears there is still work to be done in curtailing spending even further during this time of economic uncertainty." • There was "no business justification" for $355,451 of food provided at a September 2008 national sales educational conference; it included a $96-per-person dinner and a $500 "bartender charge." • An installation celebration for one postmaster -- the report didn't say where -- included "unallowable food purchases" totaling more than $17,000. The menu included "crab cakes, beef Wellington, shrimp and scallops" even though Postal Service guidelines allow for only "light snacks" at such events. • There was "no business necessity or justification" provided for $77,757 in breakfast meals for events between September 2008 and February 2009. The report, issued December 3, documented purchases for lodging, table linens, flowers and other items "that we consider excessive during this challenging economic time." "Such purchases are in direct conflict with the Postal Service's objective of driving down costs in all operations and processes," the report said. "Moreover, the public's image of such purchases could have a detrimental effect on the Postal Service's public image." The report cited two Postal Service districts that purchased movie tickets for $14,140 to give incentives to employees after the postmaster general "issued a memo directing a curtailment of spending." It also documented the purchase of 30 retirement watches, costing $216 each, in another district. A CNN investigation this year revealed that the Postal Service spent $1.2 million to buy the lakefront home of an employee who was relocating. The purchase was part of a policy that allowed the Postal Service to pay for employee homes when they moved, whatever the cost. Months after the story, the Postal Service changed its policy to limit home purchases to $800,000.